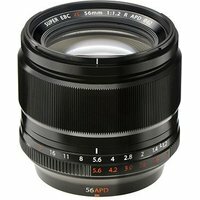 The Fujifilm 56mm f1.2 APD XF is the world's first fast-aperture autofocus lens with an apodisation filter. The maximum f/1.2 aperture delivers brilliant levels of sharpness, while the apodisation filter ensures the out of focus areas are smooth with a unique bokeh effect. This combined with Fujifilm's HT-EBC coating and advanced optical construction delivers the best image resolution possible and produces portraits with a three-dimensional feel. As with other Fujifilm XF lenses, the 56mm lens offers an all-metal barrel construction and an aperture control ring.